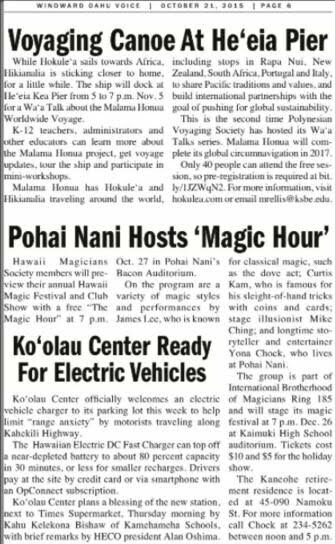 Many thanks to all who participated in the Pōhai Nani Magic Hour. The compliments have been pouring in. We had 135 adults (25 from the community) and 13 kids in the audience. The event was sponsored by the Entertainment Committee of the Hui o Pōhai Nani [the residents' association of the Pōhai Nani (which means, "surrounded by beauty") - Good Samaritan Society Retirement Community], which provided a modest stipend to the Hawai'i Magicians Society [International Brotherhood of Magicians (IBM) Ring No. 185]. 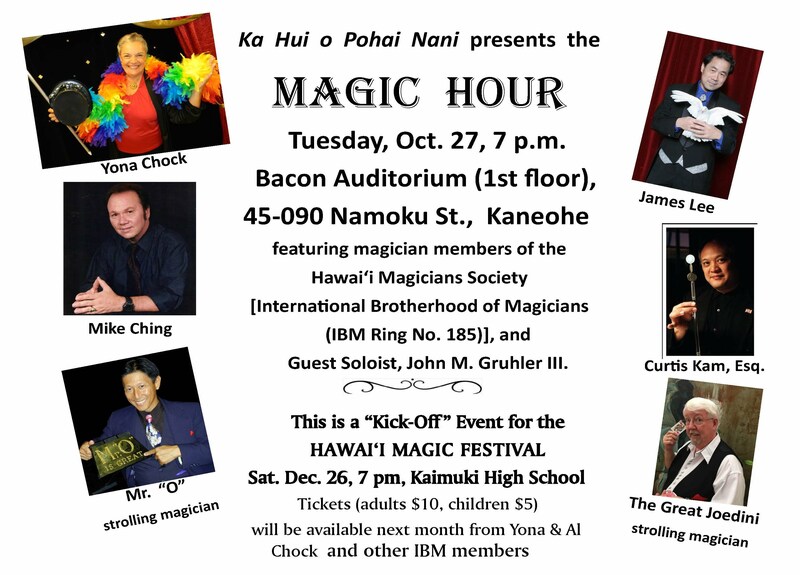 I don’t think there would be any problem doing a repeat next year as part of the Annual Hawai‘i Magic Festival (Saturday, Dec. 26, 2015, 7 pm at the Kaimuki High School auditorium), and the National Magic Week proclaimed by the Society of American Magicians (SAM), held during the last week of October. SAM has sponsored Magic Week for 40 years, on the anniversary of the death (Oct. 31, 1926) of "Harry Houdini" (Ehrich Weiss), who was SAM national president (1917-1926), and a member of Assembly No. 1 (New York City). I’ve been told that several of our older residents who usually leave shows early told their Certified Nursing Assistants (CNAs) to, “Go away!” They weren’t ready to go yet. The highest praise from Senior Citizens. The Committee considered the show to be a "howling sucess," and they might even pay us a little more, since they now know how well we go over. I think having two variety acts made for a better over-all show. We might consider that for future club shows. I can do Chalk Talks as well as storytelling. Curtis Kam, Esq.. did an incomparable job as Master of Ceremonies, opening the evening with a water trick. James Lee did his classial dove acts. Mike Ching is becoming a very proficient ventriloquist (Dr. Lee of Chinatown). Greg Gabayo might be willing to join us with his juggling act (we saw him a couple of nights later at the Hawai‘i Theatre, and he showed us the Iphone video of my Zombie Rabbit). Have we other hidden talents among us to draw out? My friend, John Gruhler (PN’s Senior Living Sales Manager), sang “Old Black Magic,” and had to learn the song with about two weeks notice, as it wasn’t in his repertoire. I learned my lesson (yet again) that I cannot successfully put on a show, and be in it, too. I’m 77 now. I have to either fish or cut bait. I don’t know how to reach everyone who participated by e-mail, so please make sure word gets passed on to all. Strolling magicians who performed close-up tricks for the audience before the performance, included Mr. “O” (Harvey Ouchi, IBM Ring 185 Secretary), The Great Joedini (Joe Page), Ron Ishimaru (SAM national 2nd Vice President), and Totoy (Faustino Betran). Mahalo nui loa and congratulations to all.